This post was sponsored by President Cheese. Thank you for supporting our sponsors. It helps keep us going! Although we’re already a couple weeks into spring, a lot of people are still experiencing frigid, icy weather. We love indulging in some of our favorite comfort foods, to help us keep warm when it’s cold out. Today it’s creamy skillet mac and cheese. 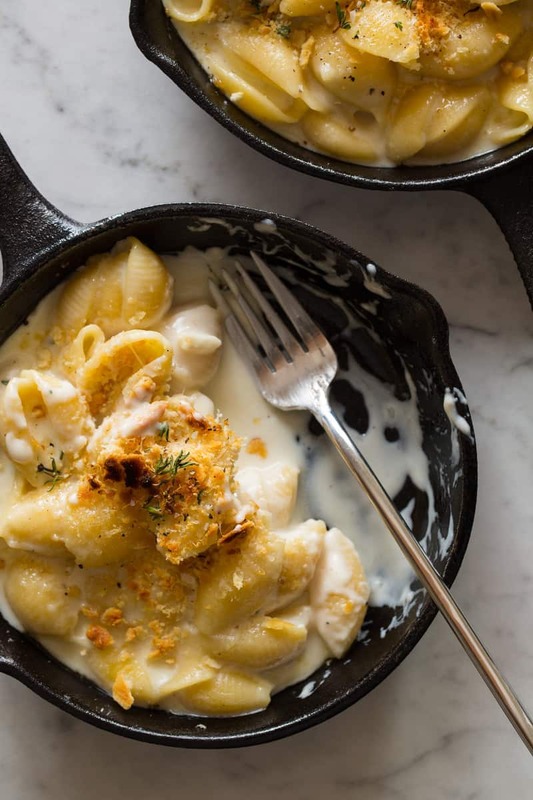 We love macaroni and cheese, especially one that’s super rich and cheesy, but there’s something about an extra creamy, stovetop mac and cheese that’s we just can’t get enough of. 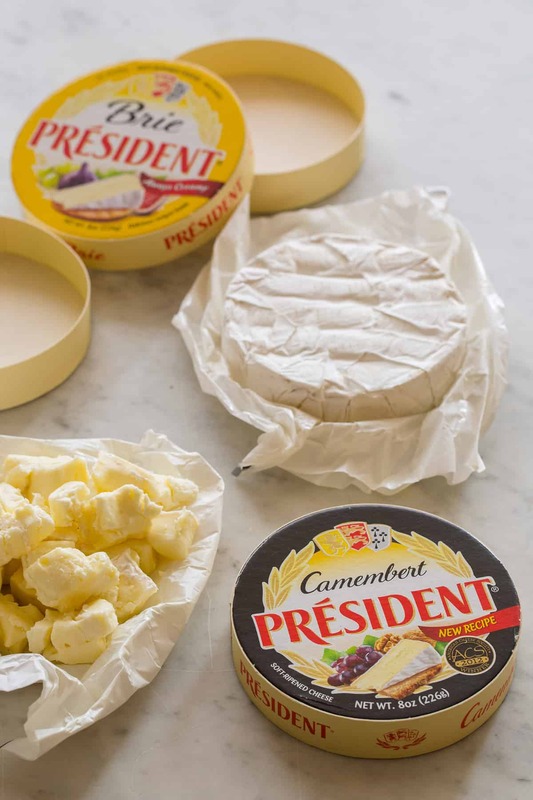 We’ve used a combination of President’s creamy brie round and extra creamy camembert cheese to create our rich and creamy cheese sauce. We love how beautifully the cheeses melt together. We recommend cutting up few extra cubes of cheese as you prepare the dish, because you’ll find it impossible not snack away as you cook. Seriously. Dijon mustard and ground ginger helps to cut the creaminess of the sauce and we love the light tangy flavor the mustard brings to the overall dish. The crushed cracker topping is one of our favorite parts of this dish and we urge anyone who makes this dish, not to skip out on this part. The buttery crackers and fragrant thyme add a much needed light crunch, balancing out the extra rich and creamy sauce. Plus you’ll probably have extra crackers, which go perfectly with all that cheese you’ll definitely be snacking on as you make this dish. Yay! Before we forget, we should mention that President’s cheese is having a Pinterest sweepstakes where you all have a chance to enter and win $50 worth of your own President’s cheese. Not too bad, right? You can visit their new website ArtOfCheese.com for details on how to enter and win! 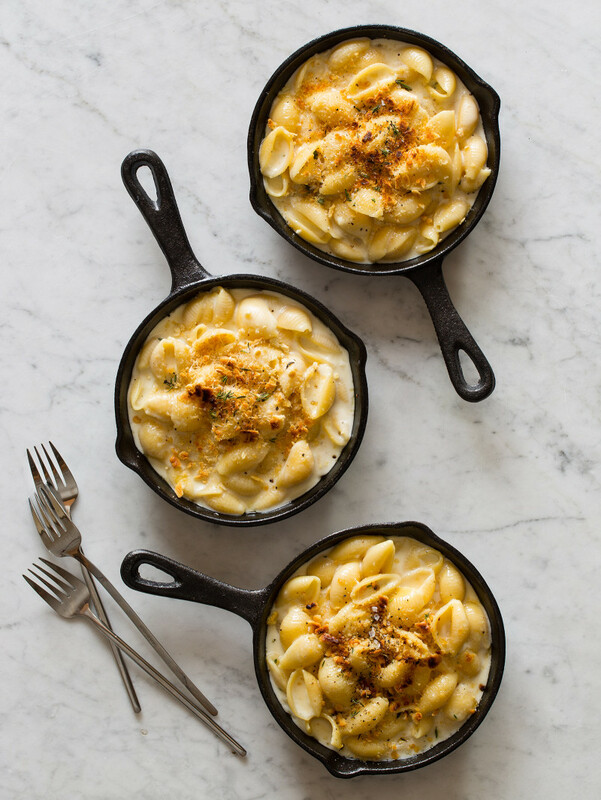 We hope some of you will try making this simple skillet mac & cheese, to help keep you cozy as the weathers slowly begins to warm up. Enjoy! 1. Fill a large pot with water and bring to a boil. Add a small handful of salt and the shells and stir. Bring the water back up to a boil and cook shells for 7 to 9 minutes or until al dente (soft with a slight bite), stirring occasionally. Strain shells and set aside until ready to use. 2. Place a 10 inch skillet over medium heat and melt butter. Sprinkle flour into skillet and stir until well combined and the raw flour taste disappears, 2 to 3 minutes. 3. Stir in milk and cream and continue to stir until no lumps remain. Lower heat to medium-low and allow mixture to thicken, enough to coat the back of a wooden spoon. Stir in mustard, thyme and ginger until well combined. Season with salt and pepper. 4. In a small bowl toss together both cheeses and lemon juice. Begin whisking cheeses into the skillet and continue to whisk together until all the cheese has been added and mixture is thick and smooth. 5. Add warmed chicken stock and stir together until smooth. Fold in the cooked and cooled shells until just combined and adjust seasonings. 6. Heat broiler to high. 8. Allow the mac and cheese to sit and cool for 5 t0 7 minutes before serving. Do you think it will work if I skip the heavy cream, change the Manchego cheese for Parmesan and the chicken stock for water? Also, step 7 made me confused. 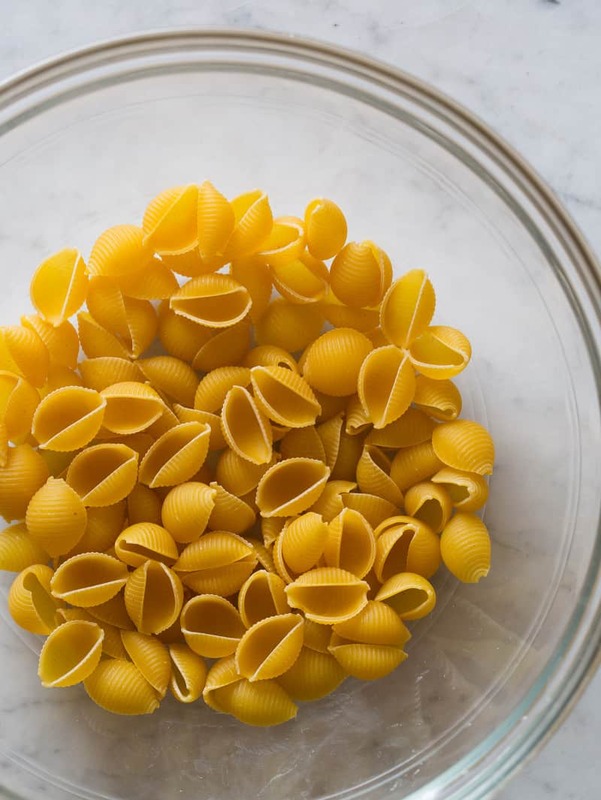 What is exactly “and place under the broiler for 3 to 5 minutes or until the shells slightly caramelize and the cheese sauce becomes hot and bubbly.”? Does that mean to put it in the oven for 3-5 min? The directions are pretty clear. Some, if not most, ovens have a separate broiler to cook things at a much higher temperature. Your oven might had a broil option on it. Otherwise you can turn the oven up super high and place your top rack as close to the heating element as possible. Keep an eye on it though, it can burn quickly. My eyeballs have never had so much fun. Ever. I often make Mac and cheese but need some inspiration to make it a but different and I think I just got it! I love brie (and Camembert) so think I’ll try this out next time I make it. I cant wait to see what difference the ginger masjes too. Thanks for sharing. I often make Mac and cheese but need some inspiration to make it a but different and I think I just got it! I love brie (and Camembert) so thinkiI’ll try this out next time I make it. I cant wait to see what difference the ginger makes too. Thanks for sharing. Sorry for the typos in my first reply. The recipe calls for Brie and Monchego but the narrative and pictures show camembert. I’m guessing that the camembert is the correct ingredient. Any way you look at it the recipe should turn out great. Oh my god. Brie and Camembert? That sounds freaking amazing. I’m so intrigued by the thyme, ginger and lemon, too…I am usually so basic when it comes to mac and cheese, but this looks stellar. awesome comfort food right here! pinned! Yum!! Creamy brie in mac and cheese sounds perfect! I’ve never understood why every Mac and cheese recipe has mustard in it. This looks delic but I fear the mustard. The mustard has a few functions. One, it has emulsifying properties. Although not necessarily needed when making a cheese sauce, it can help stabilize the ingredients. Two, mustard has a nice acidity to it. This sauce (technically a sauce morney- bechamel with cheese) is very rich and unctuous. Again, not completely necessary, but the acidity of the mustard can balance the sauce and cut through some of the dairy fat. No matter what the season you can’t beat mac & cheese. Love the combination of cheeses in yours. Wow, this is serious comfort food. I love it! I love the brie here, this is mac & cheese perfection! 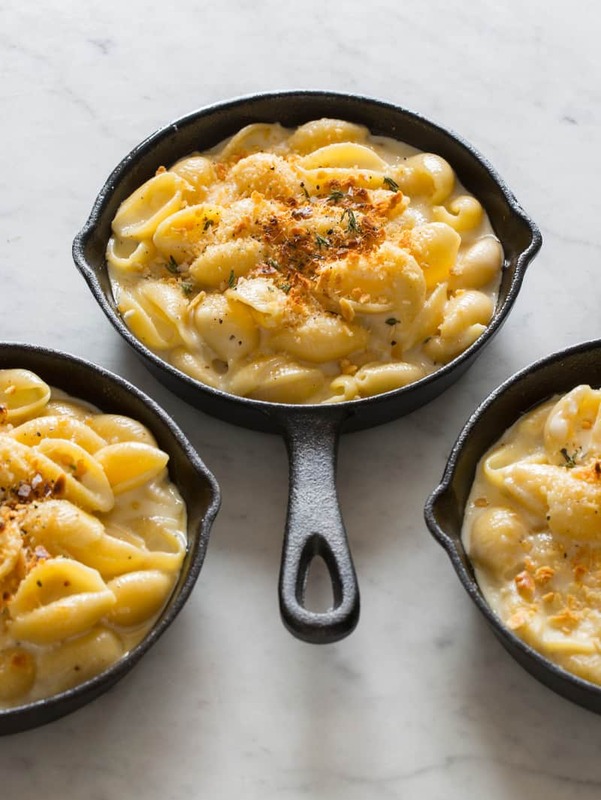 Never thought about adding ginger to mac and cheese before, but my favorite personal addition is a few grates of nutmeg, which I suppose is in the same vein of thought! Oh heavenly. Brie in mac & cheese? I can only imagine how insanely delicious this is! Those individual skillets look adorable. How big are they? I’ve never tried mac and cheese with French cheese before. This sounds brilliant. If I can stop myself from eating all of the cheese first. This is officially my new favourite blog! Mostly because of this recipe. nice serving size, and camembert, brie, dijon mustard, etc., wow!, not your kids mac and cheese, nice dinner party serving idea, thank you!